World 3-5 is the fifth normal level, and the sixth level overall in Water Land from Super Mario Bros. 3. This level takes place mostly underwater. The player starts on a pipe, below are some Jelectros, Cheep-Cheeps and a Big Bertha guarding ? Blocks (one containing a power-up), and Brick Blocks with coins. There are also some pipes blowing wind. Afterwards, there is a Blooper alongside more Jelectros and another Cheep-Cheep, as well as more wind-blowing pipes. One of these pipes leads to a bonus area with three 1-Up Mushrooms. However, the player needs to be Frog Mario, since the wind will always push the player upwards. After this, there are three more ? 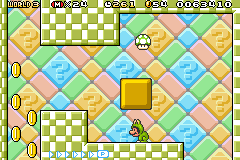 Blocks with coins and another power-up, followed by another Big Bertha and a Hidden Block with a 1-Up Mushroom. Next is another Cheep-Cheep and a Warp Pipe leading to the goal. Above the main level, there are also three big platforms made of Hard Blocks, the first and last of which have Coin Blocks on them. This page was last edited on December 3, 2018, at 07:06.